Bowhunters who put a premium on pleasant shooting qualities and maximum forgiveness will be very happy with the new G5 Prime Logic CT3. 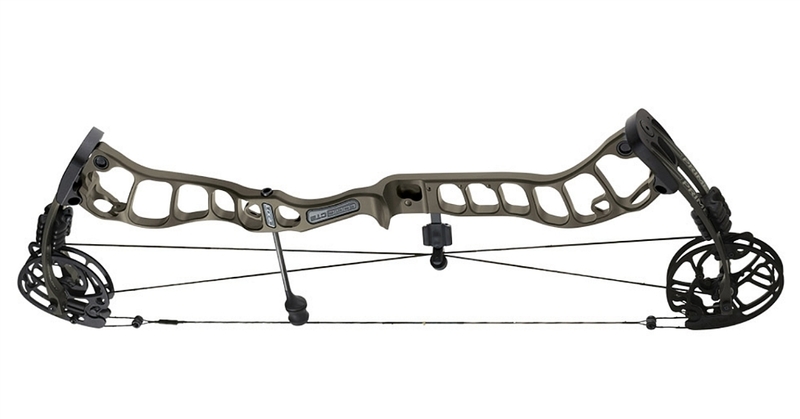 Including target as well as hunting bows, and a few bows that are essentially identical apart from length, there are 11 bows in the 2019 Prime lineup, including the Logic CT3. All have one feature in common that sets Prime bows apart from any other compound bows of which I’m aware, and that is the Parallel Cam System. This system features four cams, paired top and bottom, about a half-inch apart. Strings come off each cam in the pair, and are yoked together 1.5 inches or so from the cams. This unique system offers some clear advantages that you don’t have to be an engineer or a physicist to understand. To begin with, it virtually eliminates cam lean. It also allows for a design in which the string runs down through the center of the bow, as opposed to being offset, as is more commonly the case. This reduces torque and facilitates straighter nock travel. Another aspect of what Prime labels its Centergy Technology is that the grip is located at the vertical center of the bow, as opposed to below it. Prime insists that Centergy Technology results in a steadier aim at full draw, and Prime’s engineers have come up with some rigorous tests that appear to support the claim. The Logic CT3 (as well as the longer axle-to-axle Logic CT5 and Logic CT9) has evolved from a platform built around Prime’s original Parallel Cam System. And while the concept of that cam system has never changed from the original, the design has been tweaked over the years. Starting last year, for instance, the distance between the paired cams was widened slightly to make an already stable design even more so. To accommodate the greater width, Prime went to split limbs, shorter than the previous solid limbs, and a wider limb pocket, all of which enhanced stability. Prime’s riser has also evolved over time. The current lineup boasts 82X aluminum, which is significantly stronger and lighter than the industry standard airplane-grade aluminum. Prime also introduced the Swerve, which, as the name suggests, is a swerve in the riser, developed to synchronize riser movement between the top and bottom half of the riser to reduce vibration and improve, among other things, horizontal nock travel. Other current design features reflected in the new Logic series include Prime’s Flexis-AR cable guard, a flexible roller-guard system that can be adjusted for optimum clearance and fine tuning. Some new-for-this-year features on the Logic bows include a new grip. The difference between the grip on last year’s original Logic bow and the new Logic CT bows might appear to be subtle, but the new grip offers a flat back of a style favored by many target archers, as well as a slightly higher shelf, and the feel is noticeably different. A string weight was added this year as well, for a slight boost in speed and a reduction in string noise. A new and slightly different way to connect Prime’s optional one- or two-piece quivers should make installation of the quiver mount easier. Finally, Prime has added some color options, giving shooters a choice between a half-dozen camo patterns, five solid Tac Ops colors, five target colors, and the option to contrast limb colors with different riser colors. The finish on Prime bows is durable and always passes my scratch test. 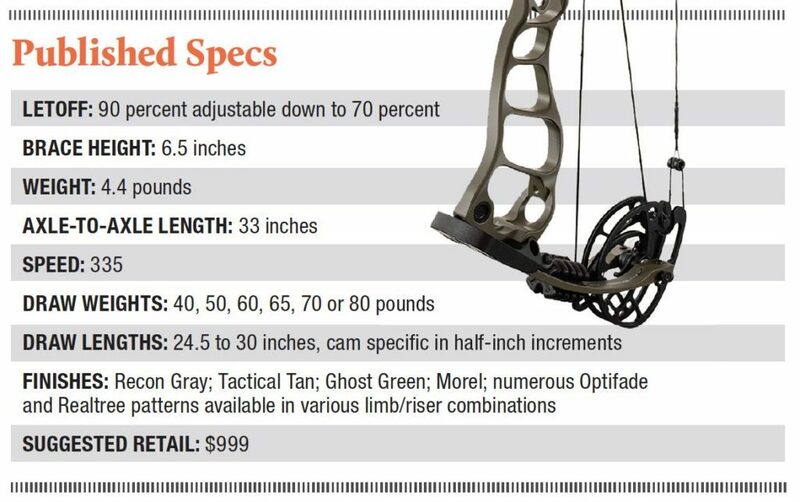 There were no visible machine marks, burrs or other imperfections on the test bow, which featured a Ghost Green riser with Realtree Edge camo limbs. Set up went smoothly. Limb bolts were snug but turned without slipping, sticking or chattering. Letoff out of the box is set at 85 percent, and I tested the bow at that setting. At 4.4 pounds the Prime Logic CT3 cannot be said to be a light bow. Compact size and subsequently better balance give a subjective impression of lighter weight. The grip, as previously mentioned, is similar to that of previous models but has a different and, in my opinion, better feel. Shooters often refer to the relative accuracy of different bows, but virtually all modern compound bows are accurate as indicated by the fact that a given bow on a shooting machine will put identical arrows through nearly the same hole shot after shot. Some bows, however, are easier to shoot accurately than others when a human enters the picture because they promote a consistent shooting form, are designed with less inherent torque, have better nock travel, or are more easily held steady at full draw. Prime boasts that all its bows share these qualities, and the subjective impression upon shooting a Prime bow tends to bear out those claims — at least that is my experience. The Prime Logic CT3 draws smoothly and shoots quietly without significant vibration. Bowhunters looking for a super-light bow or a super-fast bow will look elsewhere. But whether they’re experienced shooters with 3-D wins under their belt or beginners, bowhunters that put a premium on pleasant shooting qualities and maximum forgiveness when a heart-stopping buck steps into range will be very happy with the Prime Logic CT3. For more information, visit www.g5prime.com.